In a previous post, I compared 4 different Hada Crie models. That post was actually meant to be an initial review post, but comparison alone took up way more space than I expected so I had to do the review separately lest that post be mistaken for a thesis paper. Just as well, as it gave me more time to collect samples and give a better-formed review. Disclaimer: No subjects were harmed in the process of gathering samples, although some subjects had to be cajoled, prodded or poked to allow experimentation to take place. The highly anticipated review of Hada Crie Hot & Cool N2000! All the fancy-schmancy gadget reviewers do unboxing, so that’s where we’ll start. As they say, don’t reinvent the wheel! Note that the adapter is equipped with a Japanese plug: Two flat, parallel, identical-sized prongs. But travel adapters can easily fix that. They’re quite inexpensive too! I once got one for under $2 from Mustafa! Summary card. I like the table in the upper left where there are different courses (e.g. “Moisture course”) and they tell you what modes to use! Somehow, I feel happy when I see anything that is “Made in Japan”. My brain somehow equates it to quality and safety. Are you the same way? Right above it, it says “Do not rinse under water“. The metal piece you see at the bottom is the titanium plate, which your hand must maintain contact with for Steps 1-3. I think almost everything is quite self-explanatory, except maybe the spritz bottle. Before the start, after every step, and at the end, I will spritz water from the bottle on to the tissue to clean the metal plates. The unit is going all over your face, so keep it clean! Also, remember that the unit cannot be rinsed in water! While it’s great that we don’t have to use any specialized products with Hada Crie, it also presents a new problem. What to use at each step? At the start, I was super confused trying to decide when to use what, so if you’re the same, hopefully this will give you some place to start! However, I’m still experimenting to find out what products work best for my skin – switching cotton pads, toners, trying out step 2 without cotton pad, etc. The key is to experiment and find out what works best for your skin! To prep your skin for Hada Crie, make sure you start with a relatively clean face. This CANNOT be used to remove makeup! Position the cotton pad over the plate and snap the cotton ring over it. Slowly soak the cotton pad with your toner of choice. Not too little that it will make gliding the device over your face abrasive, but not too much that it will ooze liquid when you press it against your skin either. It hurts like a BIATCH if it gets into your eye. 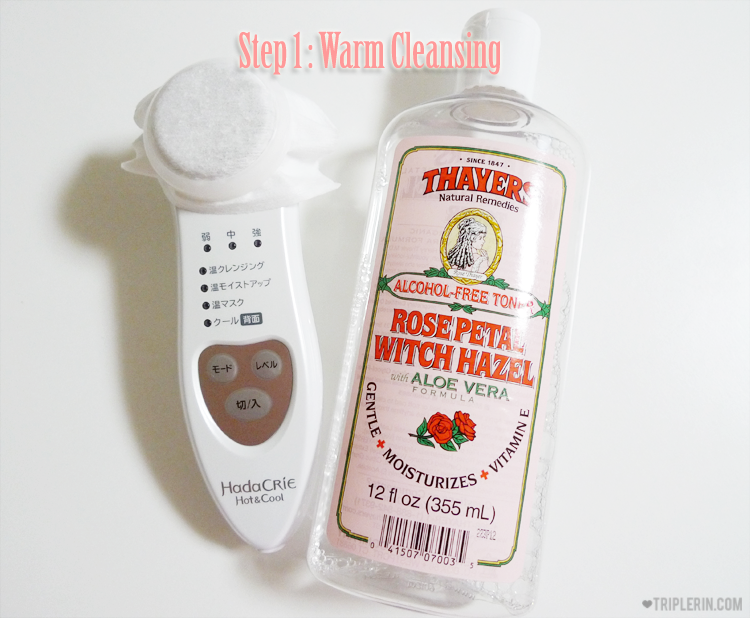 Here, I’m using Thayers’ Alcohol-Free Rose Petal Witch Hazel with Aloe Vera (what’s with the long name T_T). I got it because I saw that it’s highly raved on iHerb, with a high rating and close to 2000 reviews. They have a range of different ingredients (lavender instead of rose, etc) and the toners frequently go out of stock! It’s definitely very gentle but I don’t know if it’s effective for use with Hada Crie. Will explain more later. When you turn the gadget on, the default setting is the lowest strength and “Warm Cleansing” mode. To change the level, just press the “Level” button accordingly. It is recommended to use it on the Low setting for your first time. Step 1 releases positive ions into the skin and draws out the impurities. Which is why it’s called “Cleansing“. This model is called “Hot and Cool”, and for steps 1-3, the plate turns warm, but just ever so slightly. It’s more like barely-lukewarm to me. Short pulses emitted as the gadget glides across the skin. As there are ions released, make sure that your hand is in contact with the plate at the back. Anyway, you will know if you are not holding it right. The vibrations will stop and it will emit warning beeping sounds. 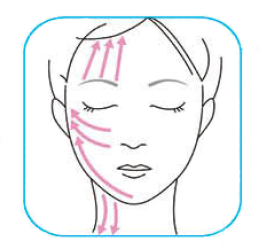 From the center of the face, glide the device outwards and upwards. I like to move it in small circular motions as I move it out and upwards as well, because that was what my facial therapist used to do and also gives me the feeling that it’s more “stimulating”, if that makes sense. 1. It is possible to use the device on someone else (like a lazy husband, for example), but you must maintain skin contact with that person for the ions to flow. Break contact and the device will stall. Tried and tested and was quite amused lol. Use a new cotton pad and soak it with your lotion of choice. I try to use lotions that are moisturizing. After all, this is the “Moisture up” step! I think Hada Labo’s Super Hyaluronic Acid Hydrating Lotion is super well-known, so no need for me to introduce it. But for the uninitiated, here’s a commercial on YouTube. The trademark scene is at 0:11, with skin so plump and bouncy! This step releases negative ions which penetrate the cuticle layer to optimize moisturizing. Again, your hand needs to be in contact with the plate. The vibrations this time are long pulses instead of the short pulses in Step 1. As before, I keep the device in contact with my skin during vibrations and reposition during the breaks in between. No need for cotton pad in both cases. But I do find that this mask was a bit too thick for my liking. I feel like the ions cannot properly penetrate the thick cotton! It’s also absolutely DRENCHED in essence, so as I glide the device across my skin, the essence will keep dripping T_T It’s really quite annoying because the essence is quite sticky. I think it’s one of the rare times there’re complaints of too much essence in masks, eh? Both positive and negative ions are released in this step, so keep that hand on the titanium plate! The pulses are extremely short for this step. I feel that using the mask for just 3 minutes is quite a waste, so after this step ends, I usually keep the mask on for another 10 minutes or so before proceeding on to Step 4. My favorite step! At least during summer. I think I’ll hate it in winter cause it’ll be freezing cold, lol. Subject F hates this step though. Like, really hate it. Insane. I don’t understand why. It’s so cooling and soothing! For this step, the plate on the back is used. When this mode is selected, it will take about 10 seconds for the plate to rapidly cool to about 10 degrees below the current room temperature. After it beeps to indicate that it’s ready for use, 1 min 50 seconds remains to pat the plate all over the face to close them pores! Yeah, this is my favorite step because the coolness supposedly will help close up and shrink pores. It’s also the main reason why I shelled out money for this model instead of the cheaper CM-8xx ones! No ions are emitted, so there is no need to be mindful of how you hold the device. The end of this step also marks the end of the 11-min full course. I do the full course about once a week. On other days, I do the “Daily course”, which comprises of Steps 1, 2 and 4. It is possible to do the full course every day as well. It is recommended that for Step 3, use the sheet mask a maximum of two times a week. The rest of the time, use emulsion type lotions instead. So how did the samples look like? The skin’s before and after? We will be mainly discussing a certain “Subject F”‘s results, since my own are quite… boring. But I will include bits and pieces of my own results on occasion. The first day, I used Muji’s peelable cotton pads. These are super thin and I thought the thinness would be great for the ions to easily penetrate. I was super disappointed after I saw how clean it was lol. As I looked at our cotton pads, I was mentally comparing it to what I read in this blog post, which is a review of the older version of the model I bought. Really, I was uber disappointed! Neither mine nor Subject F’s cotton pads look anything near hers! I really contemplated returning the gadget and maybe getting the one she used instead (the older CM-N1000). Could it be possible that the gadget performed even worse after the “upgrades”? The saying “If it ain’t broke, don’t fix it” really came to mind. I was agonizing over it the entire day, and decided in the end to give it another chance. I thought perhaps it might be the type of cotton pad used. The Muji ones are very soft, while the ones she used looked like they had an exfoliating texture. So I went out and bought new cotton pads! The ones that I bought are rated #1 on @cosme, a very popular beauty products review website in Japan. Haha! But I am DEAD SURE that there’s lots of dirt hidden in my (and Subject F’s) pores! Which led me to conclude that Hada Crie wasn’t doing its job. But I went to analyze everything again, discussed it with Subject F, did everything to shake off the heavy feeling that was hanging over me. 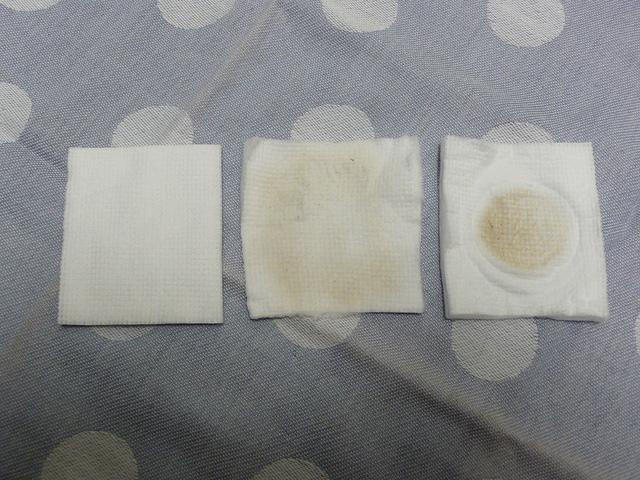 The middle cotton pad is how it looks when she uses the toner normally, and the one on the right is when it is used with Hada Crie. Then I thought about *my* own cotton pad. My cotton pad is always clear after using toner! So maybe my skin isn’t as dirty in the first place? Or maybe it’s the product (Paula’s Choice Skin Perfecting 2% BHA liquid with salicylic acid) she used that’s super effective? My toner always felt a little too gentle. I was so determined to confirm this new theory that I set out to buy the exact same toner the person used. Unfortunately, I haven’t had a chance to test it yet because I had to specially order it from USA and it’s on it’s way to me! The second thing that made me give up the idea of returning the device is that although I couldn’t see the results, I could feel it. As ridiculous as it sounds, I didn’t think to touch my skin. I thought I could just see the results from the cotton pads alone lol. So I was surprised when I touched my cheeks by accident and found that they were obviously more “Q” (or plump, if I were to say it in English). It really felt “bouncier” and like it was boosted with moisture! After that, I felt a bit better and gave up the idea of returning the product. I’ve talked about dirt removal and moisturizing. How about pore minimization, the reason I splurged on this model? Photos were taken under the same lighting, on the same couch, in the same position, same facial expression, same angle. i.e. conditions were as identical as humanly possible. I adjusted both photos to be of the same scale (using the size of nose as guide) so that comparison is fair. Apart from that, I didn’t alter the photo much so that it doesn’t skew the results. Notice that the pores are less spread out and more clustered? It’s as if the skin firmed up, which is why they are closer together! I had quite a roller coaster ride of emotions with this device. From being super confused as to which model to get, super excited to try it, extremely disappointed when I thought it didn’t perform, agonizing over whether to return it, and now hopeful of its potential. I blame it all on the price tag. If it’s just $40, I would just curse and chuck it aside if I thought it didn’t work. But it’s almost $400! So do I think it was a good investment? I’ve had it for just slightly under a month, so I think it will be hasty to flat out say for sure. But if I had to comment based on the current results, I would say that the lower-end models (N810 or N820) would have sufficed. I am 100% convinced of Hada Crie’s moisturizing abilities. I have experienced it for myself and can heartily recommend Hada Crie for its moisturizing abilities. However, my main motivation for getting this model is because I wanted the pore-minimization effect, but as of the current results, it has not delivered. I will keep using it and if anything post-worthy comes up, I will be sure to do a follow-up post. In short: I highly recommend CM-N2000 for it’s moisturizing properties. Pore minimization effects remain unknown at this point. This post was lengthy, but I hope this post was helpful and gave you a better of this model and Hada Crie in general! If you have any questions after digesting both my posts on Hada Crie, post away! I consider myself somewhat of a Hada Crie expert after so much research for purchasing and writing the posts lol. If you have any experiences with Hada Crie, please comment and share! I would really love to read about it! 16 Jan 2014: Added a follow-up post to N2000. or if in Japan, any major electrical store like Yodobashi or Bic Camera (they only carry the latest models though). Nice meeting you here! We can chat more on beauty related stuff!!! My first thought was like, geez, I must have a very dirty face! But Paula’s Choice is quite a strong toner, so becareful with that. I tried it with Naruko’s toner and it doesn’t draw as much dirt compared to PC’s 2% liquid. But another thing I think of is, is this newer model corded when you use it? It looks like yours is corded when you power it up…. If it’s not corded when using it, maybe that explains the less cleaning quality? Try a stronger toner and see if it works…. 2% liquid can dissolve all the dirt in ur clogged pores and maybe that will work? Hi i sm missing my hada crie cable CMN2000 cable. This is unfortunate. Where do i get a new cable? I think everyone has a dirty face lol, which was why I so desperately wanted to clean mine. Yeah, I will be sure to test it first, since it is possible I may not be able to use PC’s 2% liquid in the end due to allergies, sigh. If I had the N1000, I wouldn’t bother getting N2000. The functional differences are minimal, but the price tag difference is significant! The warm function -really- is not that warm, so you aren’t missing out much! Yes, it’s still corded, unfortunately. I would have loved a wireless one, but I think it consumes too much power to be cordless. Yep, still experimenting with different products to see what works best! Haha, I would love to swap – at least to try, heh. I wanna know if it’s really due to difference in products or the unit itself! Wow you surely responded fast! And yes you can call me fishball! Would love to exchange more on beauty ideas with you! We all like to keep our skin in its best condition! But yes, some people who find the 2% too strong will try the 1%…. yes the warm function can be nice…. but you can easily do it with a facial steam mister that is also very relaxing! but you are right, the new model comes with a much heftier price tag!! and with the new functions the motor will need more power to make it work…. I am going to sneak in and read through your blog now, I saw some interesting articles on cheap stay in JP!!! I currently use Paula’s Choice Skin Perfecting 2% BHA Liquid Exfoliant like Cutie Fishball does. It’s pretty strong and somewhat drying especially around the nose areas so be careful while using it. Fishball: Haha, I happened to be online, thus the fast reply! Yup, I’ll be posting more on beauty stuff in the days to come and welcome your input! I’m sorta a nocturnal being, and keep rather different hours from other people lol. Heh, I loooove Japan! Have you been to Japan before? Hello again! The post is up partly due to your nudging, so I’m glad you found it useful! If pore minimisation is not a concern for you, then perhaps the N8xx models will be a better choice when considering it in totality (function vs price). Thank you for the advice regarding PC’s 2%! Does your cotton pad also look like Fishball’s when you use it normally? I’m even more curious than before about this liquid! I have been to Japan before but it was a while ago… and I have just been to Tokyo. I would like to visit Japan again in the near future, after I save up some first… and would love to explore other cities in Japan! I basically read through all your posts on Friday afternoon at work and love the blog posts on Japan…. and the strawberry picking tour!!! And btw you know Yu Ming too? Ironically, majority of the products I’m experimenting with of late are not Japanese lol. Yep, there are definitely many other lovely cities in Japan. That is one of my goals too, to visit as many different cities as I can! I’ve read her blog before, but we don’t know each other :) But we’re quite similar, huh? Both Singaporeans, both living in Japan! With my full time job, it’s hard to stay up late these days… and on weekends, I guess the leftover stress from the week has turned me to a person with “regular” sleeping habits now… I can hardly stay awake past 1am! Yu Ming is the same too, she tends to try a lot of non US products… and both of you have big similarities… I guess one day you girls will meet in Tokyo! I have always wanted to do a trans-US road trip but I have been saying this for years… I guess when the opportunity really comes I need to drop everything and just do it! But I bet there is lot more to see, eat, and shop in Japan too! And probably take less time driving on the road too!!! hello Rin!! Thank you for the in depth review and the comparison between each models. It was really informative and well-written. I was quite tempted/curious about the N2000 model esp the cooling mode, but a few things put me off.. it has to be corded when using and also the hefty price tag! I currently have the N810 for about 1 mth and I must say it has worked very well for me! Before my skin was quite dull, rough and clogged, especially due to the hot/sunny weather in SG.. after using it consistently for about 3 weeks (i stopped for 1 week cos I got skin irritation from another product), my skin condition has improved a lot. N1000 also has the cooling mode, but still needs to be corded. But it solves at least the price tag issue? Although you will need to get a transformer for use in SG. It’s great to hear N810 worked well for you! How has it improved? More moisturised? Hey! thanks for replying! Yea i wasn’t very keen on using a transformer/corded function as I plan on travelling with it. Hence the N810 suits my lifestyle perfectly! my skin has improved quite a lot.. more even in skintone, less clogged.. don’t have flakey spots or pimples anymore..
My cotton pads are dirty even without using the hada crie with it. Some toner can clean more stuff, some are less effective. So far for me, the most “cleaning” toner is the shiseido one, hence i used it with the Hada Crie..
Yep, definitely sounds like N810 is a good match for you! It’s awesome that Hada Crie works so well for you. I’m slightly jealous lol. I’ll do a follow-up if I have enough information to form a post! Hehe. i can’t decide between the n820 or the n2000??? they’re both pricey anyways. i saw your table on your other post and i prefer the wireless option, but the n2000 has a cooling option???? ARGHH!!!!! or maybe i should just try to look for the n810 which also is wireless and can cool??? You sound like me when I was deciding on which model to get lol. FYI N810 does not have the cooling function. Only N1000 and N2000 do. really?! the beecrazy one is much cheaper than the retail ones here. n810 is going for HK$1990 in the stores! i want my pores to get smaller, but i can’t help but think an icepack will help with that instead of the cooling option. i do prefer a wireless one though, because i don’t think i can sit still in one spot for the whole process hahahah. i’m leaning towards the n820… but i think i’ll wait another month or so and see how the prices go… how much do they cost in japan? by the way, what is the ‘refresh’ option then if it doesn’t cool? N810 is retailing for about HK$900 here! It’s scary how much they marked the prices there! N820 is about HK$1,120. I think like what you said, a cool pack will work the same as the cooling function in Hada Crie, because the fundamental idea is to close the pores with a cooler temperature. I’m the very lazy kind, so an all-in-one device works best for me haha. If you don’t mind the extra effort, then using a steamer to open your pores and a cool pack to close them would be most cost-efficient! The ‘Refresh’ option in N810 is where the skin is refreshed with the combination of vibration and switching of ions (between + and -). A mask or milky lotion is used during this step. thanks rin i think i’ll wait a bit and see if prices go down. considering the mailing fees i think i’ll cost around the same if i get it here anyways! thanks for the offer! Hey, Just wanted to know if you’d be able to advise on where I could get this awesome gadget during my visit to Japan in a week! Shibuya and Shinjuku both have big electronics stores, so you won’t have a problem finding it. For example, there’s a Yodobashi in Shinjuku (east exit, I believe) where you can find it. Enjoy your trip to Japan! I’m very happy to know that my post was helpful to you! Have fun experimenting with it hehe. I would love to hear how it works for you! i ended up with the n810 too, from beecrazy for about HK$1100! totally agree with TT, your chart was super helpful – hitachi should pay you for it. Yay, you managed to decide on a model! For me, it was quite a relief when I finally decided. No more headaches and can just start using the product! I’ve never actually used washable masks before, so I cannot say for sure. I’m assuming of course that the mask is of comparable thickness to the one-time use masks, since it might not be as effective if it’s thick. Are you happy with the N2000 model or you would not buy this model again? I am thinking on buying the N2000 for the pore function. Do you recomend it? Based on my personal experience so far, I would not buy N2000 if I could choose again. For me, the N810/N820 would suffice. But allow me to qualify that I think my pores are not “large” by normal standards – meaning you will not be able to see my pores if you look at me from a normal distance. That may be a reason why the effect might be minimal for me. Any updates on this device? have you received your Paula’s choice toner? i’m very curious about how you would go with the toner. From my experimentation so far, I do think that the toner as well as type of cotton pad plays a part as to how effective Hada Crie is. The problem is just finding the right combination for our own skin! would love any suggestions you have! I think creams are a bit too thick for Hada Crie. You probably need something that is like you said, more watery. Gels or emulsions are recommended. If you still want to try working with your cream, one suggestion is to use the cream first, and as you feel the gliding getting less smooth, you can mist your face with a water spray. This will provide the moisture the gliding action needs. Personally, I use Avene. But there are many other similar types you can try. You can also try grape water spray for added moisturizing benefits. Your cotton pad was dirty too? I’m so jealous! What toner and cotton pad did you use? shu uemura and just normal supermarket cotton pads! Why does everyone get the satisfaction of seeing dirty cotton pads but me?! >___< Can I know the name of your Shu Uemura toner? And do your cotton pads have an exfoliating texture? Or are they the normal smooth cotton kind? Let me know if the misting technique works well for your cream! 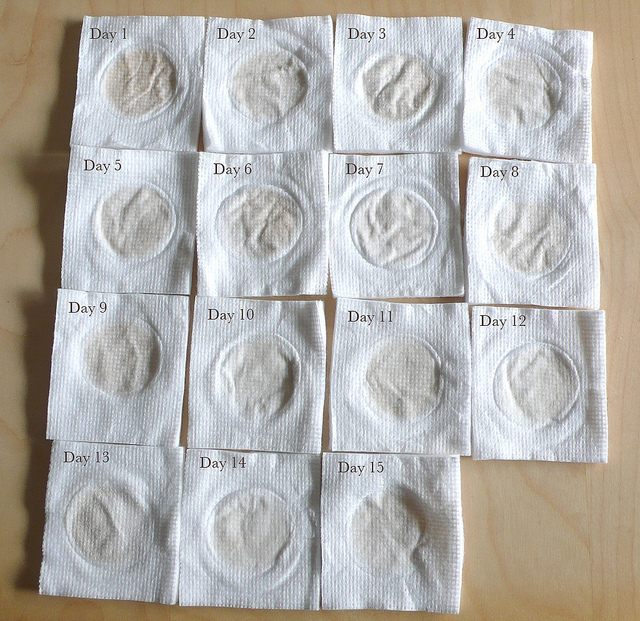 wow how come it seem yr pores get bigger after 10days of use? have u been too strong or harsh on yr face? btw do we need to power onto direct cable point when we use this product? or its for charging purposes? I might want to buy some calligraphy brushes from Japan. can u help me? Also Singaporean. how much u charge? they need cash on delivery i think. thanks. Hmmm, it’s interesting you see it that way. What I see, as stated in the post is that the skin firmed up, bringing the pores closer together, which may be why it looks like there are more pores. But if you compare pore to pore, I don’t think the size of the pores changed much at all. On the contrary, I think the products we used are too gentle. My cotton pads are nowhere as dirty as I hoped for it to be. As for your request, yes, I might be able to help you. Please send me an email with the details. My contact info can be found at the top of the page. Have your heard about “YA-MAN IB19”? I do not understand japanese and with the web translator is hard to follow :). It seem that it massage/antiwrinkle and also cleaning. Do you know the product? Sorry, I’ve never heard of the specific product you’re talking about. There are simply too many of such gadgets in Japan to keep track of them all haha. No, it cannot be rinsed under water (I did mention this in the post above). Please look under “Things I use” above to see how I solved it. I’d suggest trying bioderma water cleanser for the cleansing step. Or Guinot one step cleansing or mandom water cleanser. It works better than most of the toners. I don’t have the fancy new hadacrie just the old face crie. Thanks for the recommendations. I’m guessing you see the dirt on the cotton pad after using the toner? I’ve seen the Bioderma one in drugstores, and have also heard of it previously, so I might check it out after my current toner runs out! I actually use the bioderma to remove my make up or morning cleansing and one day decided to use it with the face crie. Worked so well since its water base for deep pore cleansing. Then i came across a few other reviews of people using the hadacrie and bioderma as well so i’m sold on this routine for 1-2 weekly. I just bought n2000. I am kind of confuse when to use it and the products that I can use. do I use it as daily with my skincare products?fyi I am using skii cleansing lotion and essence, lancome advanced genifique, skii stem power. Can I use these products with this gadget or I use the gadget first with products that u recommend and then apply my skincare routine? I am only familiar with essence so that’s the only one I can more confidently comment on. You can look at the products you have and see if any of them fits the description. It’s a bit of experimentation, so slowly work your way through and find out what works for you! Thank you so much for your input. I will try and see how it goes. I’m not sure if they are sold at Narita Airport. Sorry I’m unable to help! I bought the n2000 and I’m confuse when to use it and the products that I can use. do I use it as daily with my skincare products or do i use it few times a week and after using apply my regular skincare routine or I dont need to? I currently use Shiseido Future solution cleanser to wash my face, then Future solution softner, after the Shiseido brighton serum and then Shiseido Bio Performance cream. I’m so lost on what to use with the gadget. I also have a Dior Gentle toner, do i use that for the first step instead of the Future solution softerner? I’m so lost. I was so confuse on what to use with the steps and end up ordered the Hada Labo’s moisturizing lotions. You start with a clean face. No need to apply any product before using Hada Crie. You can use it daily or once in a blue moon; it’s all personal preference. I am not familiar with the products you mentioned, and cannot offer specific advice, but from what I quickly googled, I think it sounds like the softener is better suited for Step 2 since it is very moisturizing. Therefore, you can use the Dior toner for Step 1. I forgot to ask you do I apply my regular skincare routine after the treatment? Like night cream and eye cream afterwards? Also, after the mask do I rinse my face first then start step 4? can I use N2000 at my eye area? because I have very bad dark circle? If I use ampoules, which mode will you recommend? The skin around the eyes, especially below the eyes, are very thin and delicate and I won’t recommend for you to use the gadget there. Personally, I would use ampoules after using Hada Crie as a finishing step. But if you would like to experiment, then step 2 sounds like the best place to try. Did you find that other toners/lotions worked better than the witch hazel? I’m thinking about using witch hazel instead of my current toner, but may not do it if it’s not as effective. Great to know that my review helped! Sorry for the confusion. I meant how did you like using Thayers’ Toner with your Hada Crie? Ahh, by “witch hazel” you were referring to Thayers’? I was under the impression you were referring to pure witch hazel. I like to try new products so was looking into other options for when I run out of NUXE. i just purchased a hada crie n2000 and i’m not sure what the best order to apply product is. my evening routine for product application is: face oil, foam milk cleanser, toner, serum, moisturizer, eye cream and when i do a sheet mask then i’ll start to put the serum, etc. on afterwards. do you think it would make sense to use my thicker serum for Step 2, then follow with my moisturizer & eyecream, and THEN do Step 3 and apply my sheet mask? or is there a better more efficient way to make my products for effective? Any insight would help, thank you! Great and detailed review! Thumbs up! Still deciding which one to buy. Most likely will go for the CM 2000. :) enjoy the cold winter! Thanks! Glad it helped :) Have fun with when you get your Hada Crie! Thanks for such a useful review of the product. I would like to purchase the product from your 24kei website! Are u selling N-810 by any chance? and can you ship the product to US and how long would that take? I’m so jealous that you are staying in Japan and I would go hella crazy on all the beauty products if I were in Japan. N810 is not listed on 24kei (mainly because it has been discontinued), but I am still able get it at the moment and will send you an email shortly with details. Don’t be jealous, there are lots of beauty products in US too that I’d love to get my hands on! Thank you for a detailed review. I accidentaly found out about Hada Crie and now I want to have one for myself. Knowing some about device-based cosmetology I still cant understand how Hada Crie works inside out. To create ions there must be electrical charge on the surface. Do you feel electric shock on your skin when using Hada crie? Are there any feelings at all (like pain or irritation). Are there any contraindications to use hada crie like blood vessels located close to the surface of skin. Is there any lifting or anti-wrinkle effect from using the gadget? As far as I know manufacturers recomend to use special “ion charge cosmetics” with this kind of gadgets, to make the moisturing more effective. Do you know anything about it? There is no obvious feeling of electrical charge when using Hada Crie, and certainly no electrical shock. The electrical charge is very mild, and masked by the vibrations that accompany every mode. There should be no pain or irritation when used correctly, and the main feeling comes from the vibrations that serve as massages for the skin. Pregnant women and people who are undergoing dental treatments are advised not to use it, as these people have heightened sensitivities. Hada Crie is primarily a moisturizing and cleansing gadget, and is not really equipped to provide lifting or anti-wrinkle effects. I hope the above helps you understanding Hada Crie better! I was thinking of buying the N2000 model. But after reading your review, I was contemplating whether I should get the N1000 instead. Since your review, have you tried your N2000 with other types of toners? Does the cotton pad turns out dirtier or is it still the same? I’ve tried with it with a couple other toners, but the cotton pad never turns dark brown like what some people get. I’ve sort of come to terms with it, and accepted that maybe my skin is not that dirty after all because I don’t step out of the house that much compared to other people. I go out on average maybe two or three times a week? And most of the time for only a couple of hours. I’m not sure if the above will help you in making a decision though, haha. I would like to try the hada labo to use with this product but I am not sure which type to use. I have an oily combination skin. I am currently using the shiseido white lucent products for my skin care so I am thing using the hada labo whitening products but I am not sure.. What do you suggest? 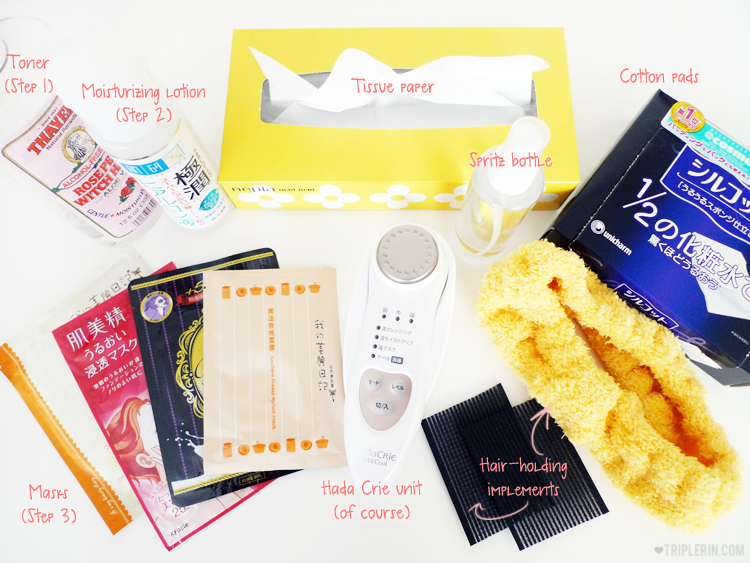 And would you be including the hada labo products in your shop? Does this mean, if I want to do the basic step, I can only do it either in the morning or evening? Can’t i do this routine twice a day? Morning and evening. If I remember correctly, I heard hada crie review from YouTube where the reviewer mentioned doing the routine in the morning and in the evening but it was with the old hada crie product not the “hot and cool”. What do you think? Will it be alright if I do the routine twice a day? Thank you :) and happy 2014!!! As for which Hada Labo product to use… the key ingredients of hada labo (which are in every product no matter which range it comes from) are all of low sensitivity to skin and oil-free, so I would say to use one with the effect you are going for. In this case, you seem to be focused on whitening, so I would say the whitening range sounds like a good match for you. I don’t think I will be listing Hada Labo on 24kei anytime soon, but I will be happy to help you with purchasing the products if you like. Just let me know and I’ll drop you an email with the details. I re-read the Japanese manual and it only cautioned against using step 3 more than once a day. I think it is ok to use steps 1,2 and 4 (in any combination or even a single step on its own) twice a day. Limit step 3 to once a day if using with emulsions, and twice a week if using sheet masks. I came across the Hada Crie 810 on another site and became so intrigued. Didn’t realize there were different versions to pick from (one too many for my indecisive self). But seeing your review it seems like the older versions might not be too different & it doesn’t hurt that it is cheaper! Thank goodness for your two posts on this or I’d feel so lost with all the models. With the 810, what kind of products would I use during the Micropat & Moisture Up modes? Assuming I use a toner or cleansing water during the Cleanse stage. Also, must I use a cotton during the Moisture Up mode? Since even the lightest moisturizer/lotion that I use is the milky kind and it seems a bit strange to use that with a cotton. I know that the older models are not made anymore, but would you happen to still be able to get hold of the 810 model? If so, for how much & what would the shipping be like to the US? Yup, you’re right. You use a toner for the Cleansing mode. For the Micropat and Moisture Up modes, I saw that you use Hada Labo’s lotions? 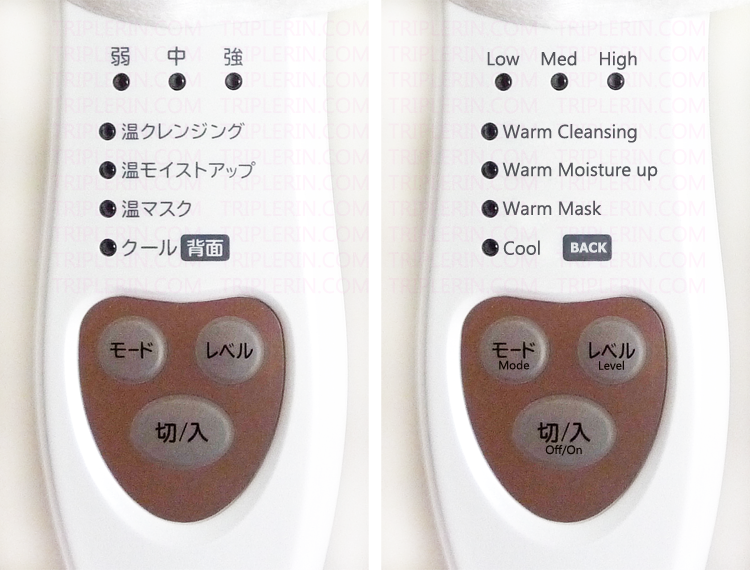 You can use them at these modes :) You might want to have a mist spray on hand for Micropat so that you can moisten your face to avoid dry burns. Yes, for N810 you need to use a cotton pad during the Moisture Up mode. The N820 was upgraded to be used without a cotton pad during this mode though, so if you want to use your thicker emulsion or milky lotions, you might want to consider N820 instead. I’m still thinking to get either the N820 or the N2000. After months of use, how did you find about the cool mode for pore minimizing? Is it any better? If budget is not that big a concern, I’d recommend you to go for N2000. Thanks for your reply. Yes, I think I will go for the N2000. I’ll write back here because for some reason, I can’t access the previous post anymore. Congrats on your (soon-to-be) new purchase! Have fun experimenting with it! please advise! my sister who just came back from Japan, bought the n1000 for me. I live in Sg and I was told that I have to use a step down power converter or some sort so as to not spoil the hitachi n1000 (correct me if i’m wrong!). I went to several stores today to take a look at the power converters and they have different watts available. I bought the 70watts in the end. i don’t know if I am right.. Please help! I can’t read the Japanese manual so I don’t know what watt is required for the product. Yes, you will damage your N1000 unit if you plug it directly into a Singapore socket. The N1000 is for use in countries with voltages between 100-120V, whereas Singapore is 220/240V, so yes, you will need an additional step-down transformer. The manual does not give any information on this. Just go to a store and tell the voltage of the product you have. They should be able to recommend the correct item that you need. Thank you for your reply! I tried the Hada Crie today and it kinda felt stingy? Is this normal? it felt like that electric current stinging. My lotion dries quickly on my skin, leaving nothing ‘wet’ for the product to glide though. could this be the reason why? No, that is not normal. You’re right to say that it’s due to the dryness of the skin. You should never use Hada Crie on dry skin. If you find that the product has dried up, either apply more or use a mist. Hada Crie should glideeasily over your skin. If you have to drag it, you know it’s too dry. Hi! Just to clarify, the only model that requires a transformer to use in Singapore, is the N1000? The others do not require a transformer correct? Thanks! Yes, that’s correct. N1000 is the only model that requires a transformer for use in Singapore. Hi Rin, Thank for your review. I have pick N2000. Because I only use natural thing for skincare, Could I use honey or oliu oil instead of gel/emulsion type products in Step 2 and 3? Hmmm, that’s an interesting question. I think if the consistency is just right (meaning not too thick or thin) to glide around the face, it is possible for use with the Hada Crie. I’m not sure how good the effects will be, but it doesn’t hurt trying! Hada Crie does vibrate from steps 1-3, and the way it vibrates is different for each step. I think I described the vibrations above. But it shouldn’t vibrate on step 4, neither should it vibrate when you remove the power. I’m not sure if it is “broken”, but you might want to check with Hitachi/the seller to confirm that it is safe for continued use. PS: I absolutely dislike the beauty diary mask. It doesn’t do anything for me even with the soaking essence it comes in. I hope my review was at least slightly helpful to you! oh…at the moment I am going to try lorea”s vichy liftactiv serum. Read a book about heaps of serum reviews. Seems good in all aspects. Hope it works! Thanks for the serum recommendation, Karen! I’ll look out for it the next time I’m out and about! Regarding the effects of pore minimization, I didn’t really see much difference in my case, but to qualify, my pores weren’t actually large by normal standards. They only looked huge to me because I place my face right up to the mirror lol. Meaning, you won’t be able to see my pores at all from a normal distance when talking to me. If you’re the same as me, then perhaps N820 would suffice! I’m looking around online to get this and came across the usual Qoo10 listings and some Hitachi-HK sites. There seems to be a parallel model CM-N28000bf or something like that and is sent out from HK. The price can be substantially lower at either SG$200+ or some even US$79+. Do you know if there are China made counterfeits out there? Of course the standard “if it’s too good to be true” stands but I’m just wondering if you, or anyone in your network knows what’s ‘Safe’? The latter seems ‘non-abrasive’ too (as opposed to the brush-type cleansing devices) and I’m wondering if you or anyone you know might have tried both devices to know the difference in outcome for the cleansing abilities? Thanks a gazillion for that info! It’s difficult when I don’t know much about the product and where to look for info! Looks like I will likely get the N28000 version if it’s identical – with english labelled buttons too! Actually, I found the HadaCrie only cos I was looking up devices that can deliver spa-like quality skincare! Can’t stand that we have to spend that much on facial packages and really happy that home version devices are created! Have you heard of Mesotherapy? The needle free version that uses electro-pulses of sorts to get minerals etc deep into the derma layer of skin rather than just the surface level treatment? I’m wondering if there’s anything like it out there and wonder if you’ve come across something like that. Again, all sources of these products come from HK…and China. Lol and that just makes me nervous! Yep, I’ve heard of mesotherapy, but mesotherapy DOES use injections to deliver products into the skin. Perhaps you were thinking of iontophoresis instead? If so, then Hada Crie performs similarly. Of course, you can invest more and get a more professional machine that does more (but also costs more). I used to go to a home-esthetician and she purchased such machines. But I think for personal use, Hada Crie is a pretty good place to start. It’s not prohibitively expensive, but also has some of the functions that the more expensive machines have. You could try it out first and if you are committed enough (most people get lazy after a while, even though they start off enthusiastically lol) you can always upgrade later! BTW, thanks for the useful tips. 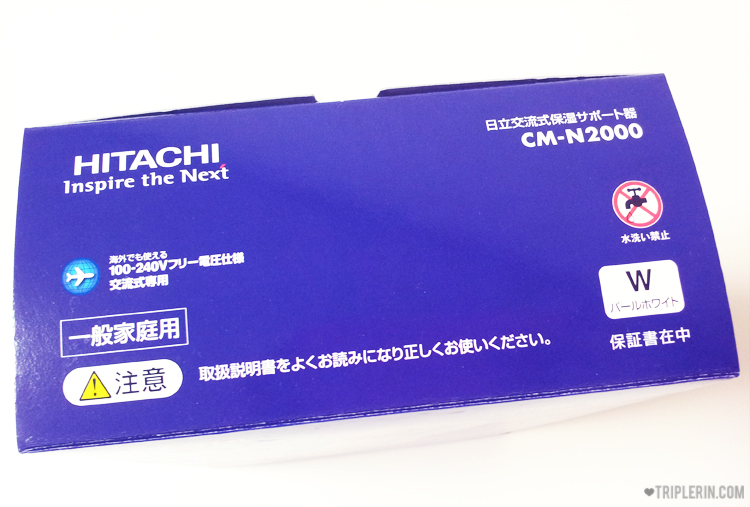 Hi rin I bought hitachi hada crie n2000 nd using from last 4 months. I am happy with results. I want to buy nuface trinity. Can I use hitachi hada crie nd nuface trinty same time? Glad to hear that Hada Crie works well for you! I’ve never heard of Nuface Trinity, but a quick google search tells me that it’s a type of microcurrent facial toning device. That’s fundamentally different from Hada Crie and I don’t think there are any issue using them simultaneously. I’d love to hear you share more about this new gadget if you do end up buying it! hey i got nuface trinity and i love it. I feel like my face is toned ,musles are stimulated and jaw lines are more defined. After couple of months I am gonna buy nuface ele too cz i want my eyebrow arch. You’re very dedicated to beauty; I only wish I had half your dedication! Thanks so much for your post! So helpful! I bought my Hada Crie 2000 after reading your sharing! May I know how many times in a day can Hada Crie be used! And you shouldn’t use the gadget more than once a day (as stated in the manual). Hi Rin, came across your blog as I was researching about Hitachi Hada Crie. If I would like to have the features of N2000 but prefers it to be wireless, which should I buy? Unfortunately you can only have one or the other. You will have to decide which function is of a higher priority to you and pick that one! Is it cheaper to buy from Japan? Maybe making a trip to Tokyo. Do you know where to buy in Tokyo? Generally, yes, it’s cheaper to buy from Japan. But note that if buying from physical stores, only the newest models (N830 and N3000) are sold. Major electrical chain stores (e.g. Yodobashi) will sell them. I will have a trip to Japan next month,could you tell me where I can buy Hada Crie in Tokyo? I know it is popular there but I don’t know anything about the electronics market so it may be difficult to find this :( And is there any store in Shinjuku or Shibuya? Thanks a lot. Hi Hanh, please refer to the post; I already answered your question on where to find Hada Crie in Japan. As for your second question, Shinjuku and Shibuya both have electronic stores that sell it. Hi Rin! I’ve been interested in purchasing a Hada Crie unit (specifically the one you used in this post), but I’m unsure what products to use with it. Some reviews on amazon.com say that you can only use certain products of a certain texture (water based, no alcohol, nothing thick, etc). I was wondering if the instructions stated that or if you’ve had any first-hand experiences with products of those consistencies. Are there any products you recommend I use and recommend I stay away from with the Hada Crie? I’m in the US but I love a great Japanese product! I also use Thayer’s Witch Hazel and feel that on some days it can be a little too gentle. I really have scrub harder than I probably should to see dirt on the cotton pad. I know this post was written a couple of years ago, though, and you mentioned trying the 2%; how is it? Have you or any of your test subjects seen any better results since this article was written? I’m sorry for all of the questions! This is the only place I can find a good review on the Hada Crie and I want to know as much as possible about it before I spend $200. Hi Tiffany, thanks for stopping by! As for PC’s 2%, I didn’t see any drastic differences like the photo of the other person above so I didn’t repurchase it. Personally, I think Hada Crie really does make the skin more moisturized, but for me, I didn’t really see the pore minimization effects. I think it really depends on the individual’s skin. Hi again! Thank you for such a quick response! Your other post was very helpful. I’ll be looking into the products you listed! I just wanted to make sure; I can use anything with the Hada Crie? Thank you for your help! Maybe this will save my skin after all!